Our sweet potato wedges are a wonderfully light and tasty side dish. Effortlessly delicious and so simple to make – what more could you ask for? The fresh herbs and lemon atop the crispy wedges make this dish a great side to a piece of grilled fish or chicken. In fact, it’s so good, our sweet potato wedges will probably steal the show. So while they were maybe intended for a side dish, these sweet potato wedges may just become the star on the table. 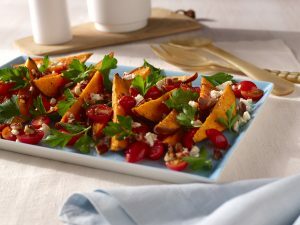 On a baking sheet coated with cooking spray, place sweet potatoes in a single layer. Spray with cooking spray and sprinkle with 1/2 teaspoon of the salt and 1/4 teaspoon of the pepper. Bake until tender, about 25-30 minutes. Let cool. In a medium bowl, whisk lemon juice, oil, remaining 1/2 teaspoon of salt and 1/4 teaspoon of pepper. Stir in parsley, tomatoes and pecans. To serve, place sweet potato wedges on a platter. Top with salad; sprinkle with cheese.